Do you want to do something special and tropical this Valentine's weekend? Well, here's an event you don't want to miss! Spend this Valentine's weekend on the beaches of Alabama at LuLu's 3rd Annual Tropical Reunion Wedding Vow Ceremony! 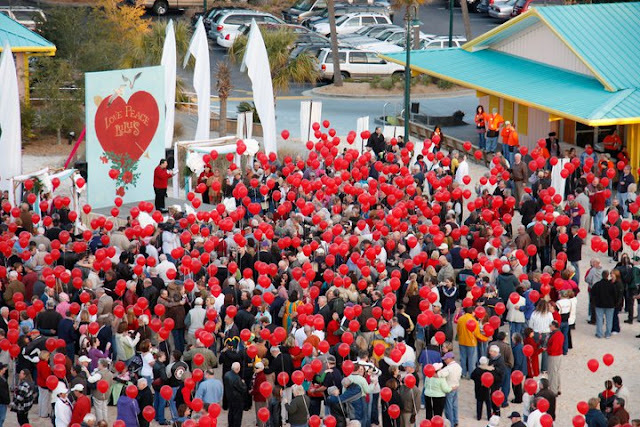 Renew your love with a ceremony on the beach at 4pm, where you will be a part of an attempt to break the current world record of 1087 couples. There will be prizes, music, complimentary cake, champagne, and lots of romance! A photographer will also be on hand to capture this memorable experience. LuLu's at Homeport Marina in Gulf Shores, Alabama is owned by Lucy Buffett. If you're wondering if she's any relation to Jimmy Buffett the answer is yes! In fact, she's his little sister and she's known for her great cooking and ability to throw a party! Being Jimmy's sister, you know LuLu's is a "Parrothead" paradise! You can even visit by boat, at mile marker 155 on the ICW. Let me know if you attend, as I'd love to hear about your experience and see pictures!